3CX, international telecommunications developer, has announced the availability of 3CX Phone System version 10. This new release includes a new user-friendly web-based app, 3CX MyPhone. Other PBX’s that include unified communications do not make features such as conferencing easily accessible for the end user. The new 3CX MyPhone portal makes it easier for users to take advantage of advanced unified communications and VoIP features by bringing conferencing, presence, transferring of calls and other rich features together in one easy to use application. The new user portal – 3CX MyPhone – is web-based, but leverages Silverlight to provide a rich –“desktop like” user-friendly experience. With 3CX MyPhone, users can easily manage their extension from their netbook or desktop and avoid having to use a cryptic phone interface. 3CX MyPhone works in tandem with softphones, IP phones and even iPhone and Android smartphones, retaining flexibility for users to choose what phone device best suits them. Transfer calls to other users. Version 10 has also gained enhanced management and security features. Administrators have finer control over blacklisting of clients trying to register against the server. It is possible to automatically block outbound calls during night time or when the office is closed, as well as block outbound calls to countries or continents to which a company never makes calls. 3CX server event notifications were expanded, and administrators can now be notified by e-mail of critical system events such as a losing connection to a remote office or SIP trunk. 3CX Phone System v10 is the only native SIP PBX for Windows. This focus on Windows allows us to optimize our code for the platform. 3CX Phone System v10 performance was improved, whilst significantly reducing memory and processor usage. 3CX Phone System can run virtualized or alongside other server applications – thus not requiring a dedicated server! 3CX Phone System is SIP standard based and integrates with a range of popular SIP phones. In 3CX v10 integration was further beefed up with seamless support for PnP deployment of IP Phones, softphones and smartphones. Administrators just plug in an IP Phone or ask the user to install the 3CX smartphone app on their smartphone (via the Appstore/Android Market). The new clients will be visible in the management console and allow the administrator to push out the settings automatically. 3CX Phone System has gone further in easing the life of the network administrator. 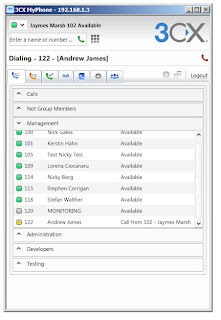 IP Phones can now be managed end to end from the 3CX Management Console. Vendor Independent! IP phone firmware versions can be checked and upgraded remotely – either one by one or in batch mode. This significantly reduces administration time and increases control for the administrators. 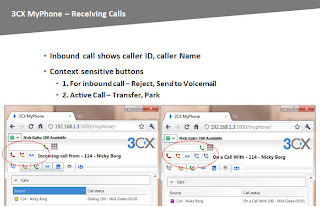 3CX Phone System can now match caller IDs to customer names, and show these in 3CX MyPhone or even on the IP Phone. Employees will be able to answer the phone knowing the customer’s name and significantly increase customer service. What’s new in 3CX Phone System V10? 3CX has also created the What’s New in 3CX Phone System v10 video which discusses the latest features which can boost your company’s sales and increase productivity. This video, along with all other 3CX videos can be viewed on the 3CX Channel on YouTube. 3CX is the developer of 3CX Phone System – an open standard unified communications platform for Windows that works with standard SIP phones and replaces a proprietary PBX. 3CX is more manageable and can deliver substantial cost savings besides increasing productivity. 3CX Phone System has earned numerous awards; Windows Server Certification, Windowsnetworking.com Gold Award, Windows IT Pro magazine 2008 and a Best Buy Award by Computer Shopper Magazine. For more information visit: http://www.3cx.com. 3CX has been known to be among the leading providers of IP phones. For this reason, it's no wonder that they have such promising features.